Christmas Holidays and long dark nights back in Europe have provided the perfect opportunity for our technical team to make some updates to the website. We hope very much these will improve your experience and make the site easier to use. The first change you may have noticed is we have a new address or url. the old www.gayinchiangmai.com has been changed to the more readable www.gay-in-chiangmai.com The new address had always been available to access the site, but now we have adopted it as the primary address. The old address will continue in operation and you will automatically be redirected to the new site and you probably won’t even notice. The second big change is we have upgraded our servers to provide an https secured connection. We know many LGBT people are concerned about their privacy and this will ensure no third parties can snoop on what you are reading on our site. It ensures a secure connection between your computer or mobile device and our server. We’ve also tidied up some of the urls used to access pages. The prefix /news/ now only applies to our news articles, and the home page for news can be found at www.gay-in-chiangmai.com/news/ /news/ is also used for tags and categories that apply to the articles and gay venues. Our gay guide pages now have a separate prefix /lgbt-guide/ see our gay guide over view as an example. Feel free to browse through our menus and see what else has changed. 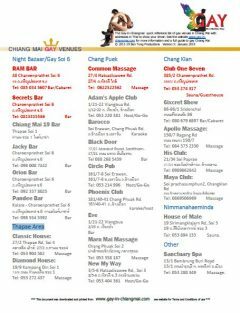 Our popular quick reference guide – A list of gay venues with addresses in Thai which you can print and show to your taxi driver – has been updated to version ten. To download it click here. Of course, in this modern age some would consider carrying pieces of paper an unnecessary evil. So for all you gadget freaks there is an easy online alternative. 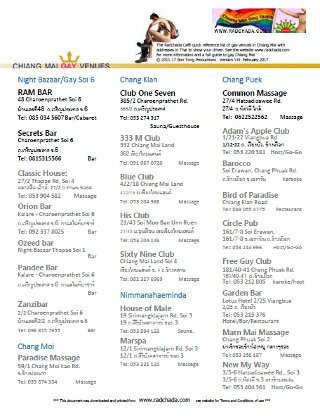 Our Taxi page presents a list of Chiang Mai’s gay venues in a highly mobile friendly format. 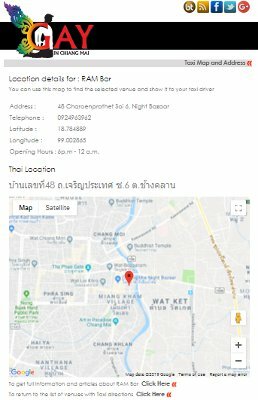 Click on any one and you will get the address in Thai along with an interactive map you can show your driver. Give it a go! For many years, and good historic reasons, we have always had two gay websites for Gay Chiang Mai. This one, concentrating on LGBT News, as well as the gay guide, and www.radchada.com which was just a simpler version of the gay guide. Radchada Café, from which the guide took its name and helped promote, has been closed for several years now (though its own website www.radchada-cafe.com) is still alive if you fancy some nostalgia). Maintaining two websites represents significant effort and, as radchada.com now adds little extra value, we took the decision to merge the two sites. The url www.radchada.com will continue to operate and visitors will automatically be diverted to to the corresponding page on this new site. We hope you like the changes, feel free to leave your opinion on the changes in the comments.